Another of the wine months according to the Wine Lover’s Calendar and this time it is Virginia. Alas this is another state that I have not had to good fortune to visit, though my Bride did, in another life. I guess that I have lived a rather parochial life as I start to reflect on places that I have visited. So I can only discuss this state from research and not first hand knowledge. Wine making has been recorded in the Commonwealth of Virginia since the 1600’s and this is really not surprising, as it was one of the earliest areas that were first settled by the newcomers to the New World. One of the most acclaimed wine collectors when this country was first being settled as the United States of America was one of our presidents, Thomas Jefferson. Much has been reported about the wine cellar at Monticello, the home of Thomas Jefferson, and even about the couple of bottles of Chateau d’Yquem that were auctioned from the estate and were still totally drinkable, which says a lot about his taste in wines and the legendary quality of the chateau. For all of Thomas Jefferson’s attempts, he was never successful in his quest to develop a winery at his estate and not from a lack of attempts. There are eight AVA designations for the state and I will briefly mention them. Middleburg Virginia AVA is the newest of the designations and they are working on creating a name for themselves. Monticello AVA which is named for Thomas Jefferson’s estate and though he attempted, others later on have achieved what he tried to do. North Fork of Roanoke AVA only has one winery at the moment, and the original petitioner for the AVA is no longer producing wines. Northern Neck George Washington Birthplace AVA, whose name is totally understandable, but seldom seen or used, due to the long and awkward name. Orange County AVA and Shenandoah Valley AVA are two designations that are seldom seen, because they tend to be confusingly misinterpreted as being from California. Rocky Knob AVA is also seldom seen as at the moment there are only two wineries from there. The last designation, outside of the name, I can not really find much information about and that is the Virginia Eastern Shore AVA. Virginia has an official state grape, which is the Norton, an American wine variety. Some of the other grapes that have been successfully grown in the Commonwealth are Cabernet Sauvignon, Malbec, Merlot, Cabernet Franc, Syrah, Chardonnay, Sauvignon Blanc, Viognier, Aglianico, Vidal Blanc, Chambourcin, Concord, Niagara, Petite Manseng and Traminette. This is another area of the country, that I hopefully will one day, be able to report upon with more first hand knowledge. This entry was posted in Wine and tagged Virginia. Bookmark the permalink. 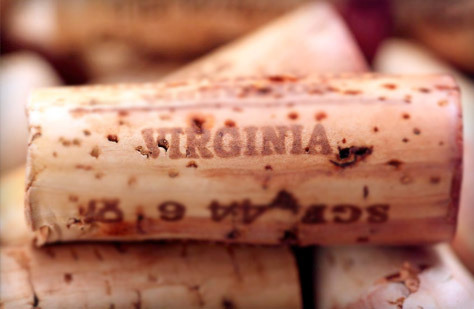 I have enjoyed more than a dozen Virginia wines. They have all been fantastic. 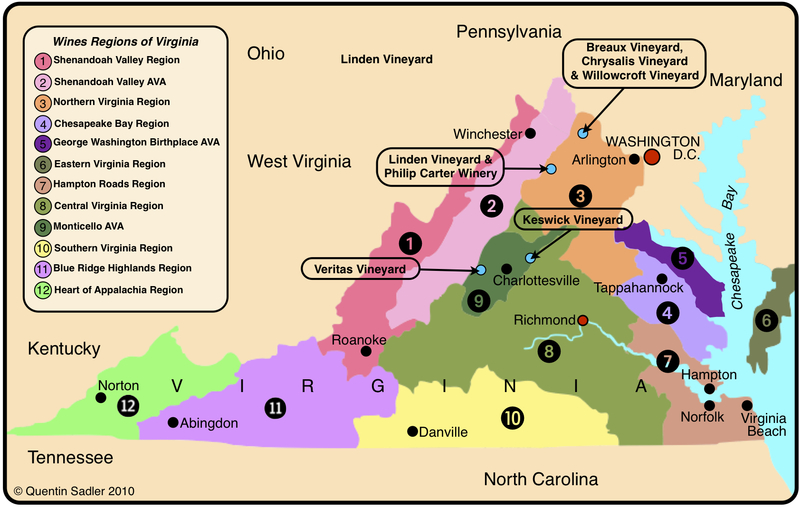 Virginia is an under-recognized wine region producing very high quality wines! Michelle, I just have to do more traveling, beyond the frequent visits to see my grandchildren. I am always impressed with what I learn when researching about wines that I have no knowledge of, but with the anticipation of eventually trying them first hand.